Howdy, howdy, partners! This is the rootin' tootin' Iron Guy and I'm letting you that this here blog is pulling up stakes, rounding up the cattle, packing up the trunks and moving to a new ranch in the cyberworld. The Iron Guy saddles up and looks boldly to the new blog location. In other words, this blog is going to move to a new site. So why are we doing this? Basically, our library system is trying to put all its blogs under one central location in order to provide better service and increase cybersecurity. (the cyberworld is a different place from when this blog started way back in 2007) But, as I said, don't worry. 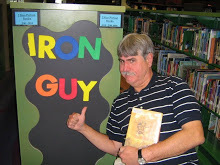 The Iron Guy will still tell you about great reads and the goofball humor you've come to expect over the years. 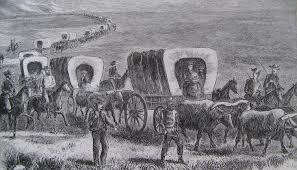 Saddle up then, all you cowboys (and cowgirls) and join me at the new location. See you there! Hey there, all you rockin' and readin' guys everywhere, April has been a busy month at the library and the Iron Guy just realized that a) the month is almost over and b) he hasn't posted anything since before spring break! Well, I'm reading some good stuff now but am not finished and I hate to go so long without talking to you, so I thought I'd do something I haven't done for a long time and stir up some possible controversy! Or not. Here's what I mean. The Iron Guy, MANLY MAN that he is, doesn't mind expressing his opinions now and then, even though everyone may not agree. Therefore, a few years ago I brought up The Great Harry Potter Controversy. Some time after that I started The Great Greg Heffley Debate and once even started a Great Dan Gutman Question but answered it right away. Today I want to tread on some potentially dangerous ground because I want to discuss a set of books by an author that all boys everywhere not only love but can't get enough of. That guy is, of course, Dav Pilkey. And the books are the Dog Man series. Now every reader guy in the whole country gets excited over Dav Pilkey's books. And with good reason. They have all the goofball humor that guys love. I recommended his Ricky Ricotta series a while back. I want to read his Ook and Glook series one day. (actually, he didn't write those; he illustrated them) And, of course, there's Captain Underpants. I don't care for them much mainly because George and Harold are disrespectful and not in a good way but boys love those books. Anyway, Dav Pilkey is always a hit with guys (and girls too) and his books are great fun and they're perfect to hand out to what the grownups call "reluctant readers" (I've always said that boys aren't reluctant to read; many of them just haven't found the right things yet), so when this new series came out I snapped them up right away. Madcap action and general silliness abound on every page. 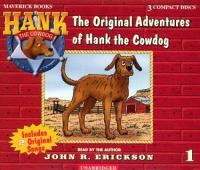 The book is filled with laugh-out-loud situations, puns, delightful Flip-o-Rama animations, and a lot of licking and chewing on furniture-enough to keep even the most jaded young reader enthralled. VERDICT Pilkey has done it again. This latest installment is just as "supa" funny and irreverent as the first two volumes in the series. Sure to be popular, it's a great choice for elementary school graphic novel collections and of particular interest to reluctant readers and fans of the series. I'ts not because the stories aren't funny; it's because of that six-year-old artwork. Remember, George and Harold wrote and illustrated these comics when they were in the first grade--when they were six. What were your pictures like when you were six? Yep, really, really simple. Now, it's cute when a six-year-old draws a picture. People love them and grownups put them on refrigerator doors. So, one six-year-old picture is nice but a whole graphic novel full of them? It gets old really fast. I enjoyed the first half of the first Dog Man graphic novel but had had to make myself read the second half. I couldn't finish the second Dog man gn. Now if Mr. Pilkey had done these gn's in his usual artwork, I would have have enjoyed them a lot more. Of course, that's how I see it but the big question is--what do YOU think? Do you like these? A lot? Or do you, like me, find them boring? But listen up--this is the point at which I'd normally challenge all those who disagree with me to defend their positions. This was usually because I held an idea different from what most people think. Like with Harry Potter or Greg Heffley. (though I'm changing my mind on HP) But you know what? I haven't met anyone who held a strong opinion about the Dog Man series. So I guess can't stir up a Controversy or a Debate but maybe I could spark a Discussion. So what do you think? The DOG MAN graphic novels--are they great? Terrible? Somewhere in between? Put your thoughts in the Comments section below and I'll post them. Come on, everyone, and join in the Great Dog Man Discussion! A triumph of sheer MANLINESS!! Yes, guys, the Iron Guy's iron determination and persistence has triumphed once again!! I had set a goal of reading that massively intimidating book, Harry Potter and the Order of the Phoenix, by the end of March. Of course, even the MANLIEST of MANLY MEN might have faltered at such an enormous task and even I questioned whether or not I could have done it. HA!! Let us forever banish such foolish thoughts! I not only finished the book but made it with a week to spare (I finished last Saturday), a testament to the Iron Guy's rugged fortitude!! Well, that and the fact that this is such a terrific read that I couldn't pull myself away from it! Let me tell you, guys, this is ONE TERRIFIC BOOK!! If you are not familiar with the story, let me fill you in. The incredibly evil Lord Voldemort returned in the fourth book. (The Goblet of Fire) Harry Potter not only saw him but narrowly escaped with his life from that encounter. The Ministry of Magic refused to believe in Voldemort's return, however, and set about to discredit Harry and anyone, like Dumbledore, who believed him. In fact, the Ministry went so far as to appoint the wretched Dolores Umbridge as the new Headmistress of Hogwarts to enforce its schemes. But the One-Who-Must-Not-Be-Named is alive and active and seeking a weapon which would make him more powerful than all the other wizards. Harry Potter keeps having dreams in which he goes down a long corridor, then up to a door that leads to--well, could it be weapon that Voldemort seeks? And what will happen if Voldemort gets there first? As I said, this is ONE TERRIFIC BOOK!! The first four books were good but they never grabbed me as they did the rest of the world. Yes, I enjoyed all the delightful magic in those books and sympathized with poor Harry in the Dursey household and when picked on by the Slytherins at Hogwarts but, overall, I found those books interesting but not absorbing. All that changed with The Order of the Phoenix. This one started off with Dementors attacking Harry and his cousin Dudley and it took off from there. You never knew when Voldemort or Dolores Umbridge would strike next, so that made me keep turning pages to find out what would happen--something that was missing for much of the first four books. And that ending! Enough slam-bang action to satisfy any guy. And a really big surprise. Plus some big reveals that not only give Harry a more dangerous load to carry but also shed some light on the . Danger, suspense, mysteries, action, bad guys who are really bad, powerful wizards and all the delightful, goofy and whimsical magic that J. K. Rowling does so well--what more could a guy want?? Some grownups have told me this is their favorite Harry Potter book and I can see why. Be sure to check it out--but not until you've read the others! This series builds on itself and you won't enjoy it nearly as much unless you've read the first four. Which, if you haven't started them, would be a great idea over Spring Break! But,then, that's tomorrow's post. OK, guys, I must admit that I have been more than a little surprised at how much I'm enjoying Harry Potter and the Order of the Phoenix. There is a lot going on--Hagrid's disappearance and return, the Sytherin and Gryffindor Quidditch match, attack by a giant snake, Dolores Umbridge snooping into everything--that makes this book a lot more exciting than the first four. And there's a sense of danger lurking throughout the book that keeps me on the edge of my seat and wondering what will happen next. Plus there a lot of questions like, "What's up with Harry's scar?" and "Why is Dumbledore being so silent to Harry?" and "What is You-Know-Who looking for?" that keeps me reading to find answers. Yep, this book has been so good that I've been ripping through the pages. Last week I had gotten to page 227 and today I'm at p. 547, which means I've read 320 pages since last week! I would normally say that you may all gasp in amazement now at my MANLY feat of determination and persistence but reading this book has been so much fun that it hasn't been a chore. Besides, I still have 233 pages left to go. Maybe i could finish by next weekend! But you don't want to hear only about me and that one book. I've got three other things I meant to tell you about before I got caught up in Hogwart's world. The first is Guardians of the Gryphon's Claw by Todd Calgi Gallicano. It's a fantasy set in modern day California that ends up going all over the known world and into the mythical world--which, apparently, is next to us all the time but we don't see it! Young Sam London is your typical kid. He goes to school every day, lives at home with his mom and doesn't think there's anything special about him. But he has an extensive collection of books about mythical animals, which will soon serve him well because he's about to encounter that world. He keeps having dreams about a powerful gryphon and, through a plan involving a tour group of seniors and their bus, gets to meet the gryphon. Something big and dangerous is happening in the mythical world but neither one knows what it is. When Sam goes back to the bus and it explodes, his adventures begin! 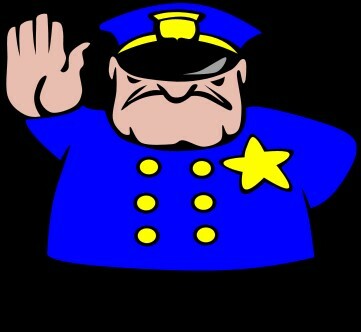 Along the way you'll meet a troll who likes breakfast at IHOP, the US Dept. of Mythical Wildlife and the remarkable Guardians. This is a good solid fantasy adventure and if you like fantasy (or even if you don't) this would be a good choice. It won't make you forget Harry Potter or Percy Jackson or Lord of the Rings but it is a good story with humor, action and (what is really great) mythical beasts from mythologies all over the world. Plus, the author lives just north of Charlotte! The second book is The Winged Girl of Knossos by Erick Berry. I first heard about this book about 10 years ago from a fellow blogger, Betsy Bird, who said Percy Jackson fans should know about it. That's a good idea in some ways because this book gives a good glimpse into that ancient world and into the Daedalus story. It turns out that Daedalus had a daughter named Inas and she likes to do adventurous things like diving for sponges or practicing the dangerous sport of bull leaping. She also likes to try out her father's latest inventions, pair of wings that could make people soar like birds. She has to do it in secret, however, because the superstitious people of her island of Crete would not understand and create trouble for her and Daedalus. She will need all her adventurous skills and her wings for a daring rescue at the end of the book! I really enjoyed this book. Historical fiction, like fantasy, is a great way to walk around in another world for a while. There's good adventure here but the book's pace is slower than Percy Jackson. If you're expecting slam-bang, thrill-a-minute action like you'd get from the PJ books, you'd be disappointed but if you like a good solid story with a thrilling ending and a fascinating chance to see the ancient world through the eyes of someone who lived in it, this is for you! I saved the best for last. Do you remember when I started listening to The Worst Class Trip Ever by Dave Barry? Well, I finished it yesterday and, man, was it ever FUN!!! I don't know how Dave Barry does it but he manages to make you both grip your seat in suspense and laugh out loud--often at the same time! There is danger and suspense aplenty but there is also loads of the goofball humor that guys love so much and Dave Barry understands so well. I won't try to summarize the story here (too many turns in the plot) but let me tell you it involves potential terrorists, kidnappings and frozen pizza, missiles flying from the White House lawn, box lunches, Homer Simpson burps, purple Crocs---and the President of the United States! Oh, wow, guys---I could talk about this audiobook all day but, to keep from writing 20 more pages, let just tell you that you need to listen to this! Actor Todd Haberkorn does a perfect job getting all the voices right and wringing the maximum suspense and fall-on-the-floor humor out of every situation. Are you going on spring break soon, guys? Take this with you! Or are you staying home? Listen to it in the car as you're driven around. Even if you listen to it going back and forth to school, I can guarantee that you (and the adults driving you) will have the best car trip ever! All right, guys, it's been a full week since I took up the challenge of facing the one major fear of my life---reading Harry Potter and the Order of the Phoenix--and I'm making some progress on it. In fact, I've been really surprised to find that I'm enjoying this book a lot. I mean, a whole lot!! Much more that the other four books. The story had a slam bang beginning (Harry and Dursley getting attacked by Dementors) and the pace and excitement haven't let up since then. Now don't get me wrong; I don't mind a book that takes its time to get started but the first four books took forever to get going. Anyway, I'm enjoying this one so much that I look forward impatiently to free moments when I'm not working so that I can read a few more pages. That hasn't happened since the days when I was reading the first Percy Jackson books or the Copernicus Legacy books! I've still got 643 pages left to go!! Well, time to redouble my MANLY efforts if I'm going to finish this thing before the end of March. If I could read 30 pages a day, then it would be possible. Fortunately, this will be easy because I'm enjoying it so much! The only problem is, however, this book is so BIG and HEAVY that I'm getting worn down to the ground by carrying it around. In fact, I tried to hire a personal assistant to help me. I called Chuck Norris but, when he heard what book it was, he yelped in fear and slammed down the phone. Same thing when I called the Hulk. Yep, it's that big and heavy. Strong enough for one but not the other! I stood it upright and National Geographic called and asked where the new mountain came from. I stood it upright again and the Charlotte city government called and asked if I had a permit for the new skyscraper. 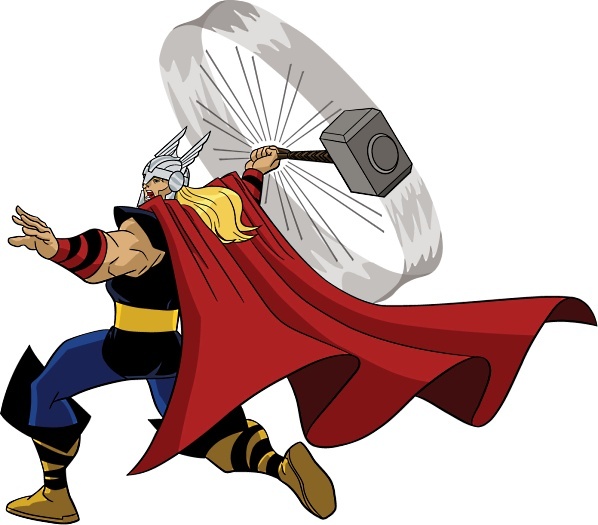 What the difference between Thor's hammer and this book? Thor is strong enough to lift his hammer! I told you. Of course, you see I'm joking. But why should I have all the fun? If you boys know of any jokes (or could make up any) about how BIG and HEAVY this book is, send them along in the Comments section under this post. (gotta keep them clean, of course) I'll post them on my next Update and be sure you get one of the cool new bookmarks. OK, I can't wait to hear from you! I've got to go now and move that book to a different location. If I let it sit in the same place too long, the building starts to tip over to that side. Yeesh!! Hide me from it!! Iron Guy starts to run. "You're not allowed to run from your fears, Iron Guy!" "Never mind! Go back and read it like a MANLY MAN!" Well, I'll put the goofiness aside and talk for real about this book. First, I should let you know that I've never been a big Harry Potter fan. Now, don't get me wrong--I'm not a Harry hater. Those books are OK. I read the first four and liked them well enough but I've never gone Hogwarts wild over them. (yes, I intended that pun!) I know a lot of you guys are total Harry Potter fans. Kids (and grownups) have been telling for years how much they not only like but LOVE these books. I remember that some libraries held parties when new HP books came out. I remember when bookstores opened at midnight so that kids could get the latest titles. I've heard for years about how terrific Harry Potter is but, for some reason, I just never fell under the Harry Potter spell. (I intended that pun too!) So I've just never been in a big hurry to finish the series. And part of it is a kind of fear. Not a "blind, unreasoning panic" (as FDR once said) but a sort of intimidation of the huge size of that book. It's 870 pages long!! I'd need a forklift to carry that thing around!Or at least a pickup truck. Seriously, though, how could anyone, even J. K. Rowling, write something that long and keep it interesting?? So, yeah, I've been a little afraid to plunge into it. But, in all seriousness, if so many people like it so much, there must be a good reason. And my good friend Ms. Yingling, whose judgement I trust, said this was her favorite in the series. So, OK, I will take the Potter plunge and get started on it. But I will need your support! No mater how tough a guy may be, whenever he undertakes something this big and scary, he needs the support of his brothers-in-arms. Are you with me, men?? If so, then send a comment in the Comments section below. Let me know that you have my back and will support me as I undertake this monumental task. Or if you just want to say I'm a crybaby and should get on with it, that's OK too. For I intend to finish this book by the end of March. Think I can do it? Or am I biting off more than even this MANLY guy could chew? Let me know in the Comments section! Yeah, they look like they may be more appropriate for a Percy Jackson book but that's what I've got so far. Maybe I'll change the pictures later on. (and, yes, I know there are girls who read this blog, so I'll create some for you too) If you live outside of the Charlotte, NC area and you'd like one of these bookmarks, please let me know in your comment how to reach you (I won't publish that info!) and I'll send them along.